November already comes to an end and the Christmas season finally starts, so of course we’ve also included some Christmas events worth visiting. Therefore just call it a pre-Christmas Special to slowly get into a cozy Christmas mood and next week I will let you know about more ongoing events in December. This week the Vancouver Christmas Market got back on Queen Elizabeth Plaza. It started on November 21 and will run till December 24. This temporary village will once again boast ‘unique’ food like German ‘Glühwein’, ‘Spätzle’, ‘Bratwurst’, handmade toys and different kinds of treats from over 50 vendors. All the Germans here who miss going to a Christmas Market with their friends the time before Christmas: I’m pretty sure by going to that one here in Vancouver, even though it’s not the same and pretty tiny compared to the ones in Germany, it’ll might let you feel like you would be in Germany. At least a little bit! Furthermore the Capilano Suspension Bridge Park is transformed into a world of festive lights. In that park you are able to see the world’s tallest living Christmas tree (153 feet tall). Besides that they have also some events going on, for instance you can experience the voice-activated light show, you can go on a scavenger hunt throughout the park, you can take photos at the Winter Pavilion and even more stuff. I can easily imagine how gorgeous the canyon must look like with all the lights on! VanDusen Garden is celebrating the Festival of Lights where you can stroll with friends through the botanical garden. Certainly it’s not just walking through the garden but they also have some specials like for example you can take pictures with Santa, try different holiday treats, enjoy Dancing Lights shows and delight in much more. You will definitely not get bored at those events! Since one of our candidates is hosting another (probably legendary) house party on Saturday night I hope no one is having a bad hangover on Sunday so that we are able to go to the Capilano Bridge on Sunday, November 29. If you want to join us we will take the shuttle bus at 2:00 pm at Canada Place, which is additional insert to take the visitors directly to the park. Here we go again! Unbelievable time flies so fast. Not only that the next weekend is right around the corner but also Christmas is approaching very fast and I’m done with my practicum in three weeks already . . . Anyways, any plans for the weekend? Christmas Market season already starts this weekend!! For sure you shouldn’t miss the Vancouver Christmas Market where you can have typical German “Glühwein” and “Bratwurst’’. That one is located at Queen Elizabeth Theatre Plaza, West Georgia Street and Hamilton and transforms the heart of downtown into a festive wonderland for the holiday season. Not every Christmas market in town is for free, so the Vancouver Christmas Market (admission: ~ $8) but the one in Yaletown is definitely for free! The Yaletown holiday festival, called CandyTown, is just once a year. This year, on November 21, a lot of street vendors will again sell their candies, waffles, Christmas presents and much more. Additionally dressed up characters will participate in Christmas parades. Downtown Yaletown will be transformed into a winter/Christmas wonderland. If you’re not yet in the Christmas mood you’ll definitely have the chance to get into the mood at this market. The outdoor Christmas festival opens from 12pm to 7pm, local artisans and street performers will secure that you don’t getting bored. On Sunday it’s time for us to go to Seattle just for a day. We are going with WestTrek, which means a lot of fun is guaranteed. Besides having fun we will do some sightseeing and of course you will also have some time to do some shopping. Possibly even buying some Christmas presents already since shopping in the States is much cheaper than in Vancouver. But it’s not all about shopping quite the contrary we are going to downtown Seattle and along the way we will stop at the Space Needle, which was designed as a futuristic spaceship in 1962. We will also go to the Pike Place Market! It’s one of the most visited places in Seattle because the seafood there is supposed to be amazing. This is also where the first Starbucks was built in 1971 and still exists! 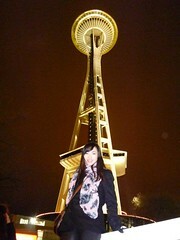 To check our Seattle itinerary, please click here. DEPARTURE is at 8:00am so make sure you are in front of the Waterfront Station 15 minutes prior (7:45am). Have a nice weekend and see you on Sunday! 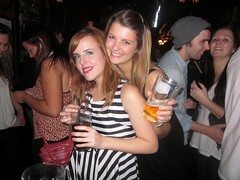 We started off the week by saying goodbye to our very own Marianne by having partying it up at our Pub and Club Night! It’s actually more of a “see you later” as I am sure we are going to see her again soon! Irene and I are very jealous of seeing all of our hospitality candidates go off to the Rockies ski resorts because it will probably be the best time of their lives. Skiing and working with other young people just like you. What can be better? On Wednesday, we decided to do something different than a regular pub night, because we were just at the pub not too long ago! Off to the Vancouver Christmas Market we go and it was this cute little village-like market with lots of little shops selling homemade German food and crafts. 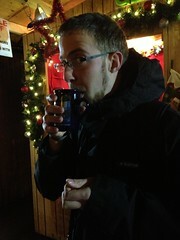 A hot mulled wine or apple cider was the perfect drinks to walk around in the cold. Of course, we decided that we needed our regular fix of a pub night so we ended up at the Library Public Square which wasn’t too far away. 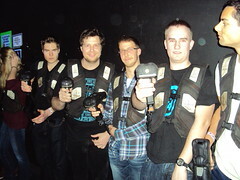 And, why not end this week off by going Paintballing with us tomorrow? You get to act like a kid again, but this time, with bigger guns! It’s going to be so fun so sign up here on Facebook! See you tomorrow at 11AM! Finally, next week, we are going to Seattle and you don’t want to miss out on that either. Find out whether it is true or not that “everything is bigger and better in America.” You be the judge! Let us know here on Facebook by early this week that you are coming and we will contact you! INTERNeX Canada: What to do on the Weekend? Wow, it’s the weekend again! As you may know, this weekend is American Thanksgiving so there are many stores offering discounts on their merchandise in the United States and here in Vancouver. But, there is more than shopping going on this weekend! Because it’s so close to December, lots of Christmas and winter festivities are starting to happen. We have found plenty of things for you to do so listen up! Whether you want to prove that you can win alone or team up with people and come up with a strategic plan, this will be one of the most fun times you’ll ever have! So safe up your energy and come ready to see some live action on Sunday! Don’t forget to sign up on our Facebook event HERE! For all you Germans out there, this will hopefully cure your homesickness! The plaza at Queen Elizabeth Theatre is transformed into a romantic tiny village with rows of little wooden huts decorated in pine branches and festive lights. You don’t want to miss the live entertainment, carousel rides and shops selling handmade gifts! The best part is probably all the European food and drinks including German Bratwurst, Swiss Raclette, Lebkuchen, baked apples, spiced Christmas Cake (Stollen), the famous German Christmas Drink (Feuerzangenbowle), authentic hot spiced red wine (Gluehwein) and a selection of German beers (Weissbier). I went last year (and will go this year again) and for sure would recommend everyone to take a visit! I know many of you are football (American football in a Canadian league, not soccer/England football – yes confusing, I know) fans out there. Though the Vancouver Lions lost last week in the Conference Final, you sports nuts will want to watch the Calgary Stampeders battle against Toronto Argonauts. The “Grey Cup” is the championship game in the Canadian Football League (CFL) and is the name of the trophy given out to the winners. It’s the 100th anniversary of the league so this is a must watch event! Where? Why not make this an excuse to check out some of the best sports bars in Vancouver? When? Sunday, November 25th @ 3PM.